For the company it’s a powerful marketing tool. For the staff it’s a pat on the back; praise for a job well done. We’re talking about builder awards, and the call for submissions for the annual OHBA Awards of Distinction has gone out. If anyone has had second thoughts about whether to enter simply needs to have a brief conversation with Brian Johnston. The president of Monarch Corporation, a past winner of a number of OHBA awards including Ontario Home Builder of the Year, says winning an award is more about recognizing the team, and good for staff morale. “I think it is worth entering. It really is about demonstrating senior management’s or the owner’s belief that the company is creating or marketing in a way that they are proud of. In other words, it validates, in a tangible way, the direction the company is moving in,” Johnston suggests. Builder or Project of the Year, however, do require an enormous commitment to the craft and a passion for the industry. Builders who have won in the past have demonstrated numerous qualities that had to be pulled together to create a remarkable package — innovation, customer service, creative marketing and a dedication to consistently build high-quality homes. 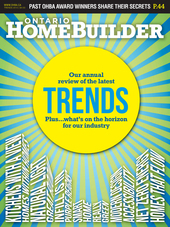 Ontario Home Builder approached some past winners to learn their secrets for success. Whether it was a desire to keep those secrets close to their chest or just a sincere modesty, these builders claimed the steps to top recognition in the industry were reasonably simple. Their advice is to believe in what you are doing, build with passion and look after your customers. Simple in theory perhaps, but in practice the strides required to receive such high praise are challenging. Yet, establishing a clear plan and sticking to it seems to be the answer. “It’s not magic,” notes Jessica Clinesmith, vice-president of sales and marketing at Mattamy Homes. She points to Mattamy’s OHBA Ontario Home Builder of the Year honours in 2006, 2008 and 2011 and says it is more about consistency powered by the passion of the staff. Clinesmith says it is hard to identify and single out a trend or innovation that puts a builder over the top in an award competition. It’s more the ability to deliver high quality products reliably over time and, in Mattamy’s case, centre on creating communities and collections of neighbourhoods, not soulless subdivisions. One aspect that has helped knit newcomers together, Clinesmith explained, is front porches in homes that get people out of backyards and engaging with neighbours. Kerrigan said Brookfield doesn’t fear setting the bar extremely high and meeting the challenge to deliver on its promises. He feels one sweeping factor in the 2010 win was the exceptional footprint Brookfield operated in during that period. “We had projects from Oshawa to Brantford to Niagara-on-the-Lake, one of the few to have that reach in 2010.” That meant delivering many different floor plans on a wide variety of lot sizes in as many as 20 separate municipalities, a huge challenge. Meanwhile, Johnston feels that simple respect for a company building homes since 1936 may have factored into the 2003 OHBA Ontario Home Builder of the Year Award. That said, he thinks Monarch has been at or near the front in terms of land development and design, possibly another reason for the honour. While past winners agree consistency and excellence are the bedrock of their businesses, they are divided on trends like marketing via social media such as Facebook, Twitter and YouTube. Kerrigan says Brookfield Homes is fully in, having hired a communications executive two years ago who has a strong social-media background. And Ritchie stresses Tridel has a digital journalist on staff who writes stories and updates regularly for social media as well as a website, condo.ca, which offers lifestyle articles and advice from designers. Address every point of the submission guidelines. Style your spaces before photographing. Try to maintain consistent camera angles on before-and-after photos. Submit photos of details that can influence judging. 5. Keep descriptions brief but very informative. The bottom line is if you don’t enter, you can’t win. And you could be missing out on an important morale booster for staff and a bragging point with current and potential homeowners. To enter go to www.ohbaaod.com. The deadline is June 13. Awards can be a powerful tool to differentiate your company from the competition. This is how advertising experts suggest you make the most of your win. Tell the media. Use PR to ensure all media outlets pertinent to your market know about your win. Get them primed by announcing you are a finalist. That alone is a bragging point. Celebrate with your current homeowners. Make sure you communicate the good news with current homeowners. They are proud to own one of your homes and will tell family and friends about the success of their builder. If you win for a room design and that room still exists in a model home — invite current owners and the public at large to come view your award-winning kitchen. The idea is to build traffic. Make your win part of your ongoing marketing — website, brochures, press releases, etc. Find a way to highlight the win in your sales office. It might be as simple as a framed poster with all your wins; even finalist placements are worth mentioning. Put your awards on display. If it is your first win, park the trophy on your reception desk for all to see. As you collect more, perhaps a display case is the ticket. Everyone who walks into your office should know you are an award-winning builder. Create an environment where every employee has an emotional investment in the housing product. That passion rubs off on consumers, too. Don’t fear lofty aims. Challenge your team to meet higher expectations. Create as many touchpoints as possible with the homebuyer and maintain communication beyond the point at which the new homeowner occupies the home. Planning and home design should aim to connect people and activities in a new community. It’s the right thing to do, but it needs to be done right, not as a gimmick but as a sustainable component of new housing.